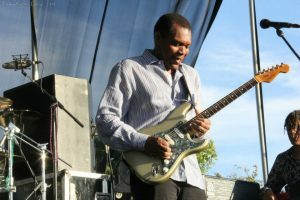 Robert Cray has been bridging the lines between blues, soul, and R&B for four decades, and over that time has accumulated five Grammy wins, a Blues Hall of Fame induction, an Americana Lifetime achievement award, while embarking on countless tours and producing over twenty highly-acclaimed albums. Growing up in the Northwest, Robert Cray absorbed The Five Blind Boys of Mississippi’s gospel, Bobby Bland’s soul, Jimi Hendrix’s rock guitar, and the Beatles pop sounds. He then brought all of these influences into play throughout his career, but his teenage band was captivated by Southern Soul and the blues. The glow of a career in music began when Cray was a teen, and in 1974 it burst into flames as the Robert Cray Band came together in Eugene, Oregon. How strong was the fire? “Richard (Cousins) and I didn’t own a vehicle, and we were staying with his girlfriend in Eugene. We hitched a ride to Salem, where our drummer Tom Murphy was going to school, to rehearse,” Cray recalls. With the group’s 1980 debut release “Who’s Been Talkin’” word about the Cray Band began to spread across the Northwest and down in to California. And the band continues to pack the house. On Friday, February 8, The Robert Cray Band will play the Elsinore Theater, 170 High Street SE, Salem. 8:00 pm. $38.00 – $58.00 Cascadetickets.com. All ages welome.